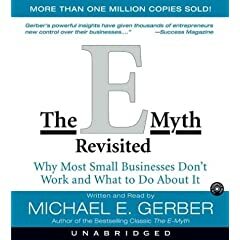 The E-Myth Revisited is a book by Michael Gerber that is based on his many years of experience in helping small businesses see success by realizing the difference between the Entrepreneur, the Manager, and the Technician. This is the overarching theme of his book, and you’ll hear (or read) it a lot. If you are wondering why, as a great technician, you can’t seem to see success as a small business owner, this book will open your eyes to what you may be missing. One piece that really caught my attention: The Technician looks at the customer and asks, “why won’t they buy my product?” The Entrepreneur looks at the customer and says, “what product or service can I provide to you?” If you can’t make that transition, now you know why you won’t be successful. I have to admit, the author’s voice made this one tough on me. This may not have been a good “Reading while Driving” choice. Very Repetitive. You’ll definitely walk away knowing that there is an Entrepreneur, a Manager, and a Technician. If you choose to read nothing else about starting a business, this may be a good choice for you. For consulting work, I’d steer you toward Alan Weiss, Michael Port, and Seth Godin for better advice all the way around. Saw this on Google Alerts, thanks for your kind comments.